cigar was what I was looking for...a perfect blend! Nice cigar for the money! A friend left me a few of these fine cigars at my cabin. I am hooked, nice mild to medium smoke, easy draw. Perfect size for me. I love the individual cedar wrap. Was surprised at how reasonable the price was first time I ordered for myself. I have added this stick to my list of regulars. Just the right size and body. Always fresh from Best Cigar. Over time I've bought over 10 boxes. You can't go wrong with this AF cigar. One of the smoothest best tasting cigars I have ever had. Highly recommend it to everyone! I like the tast and the fact that their is not an after tast the next day. I am very happy with the Arturo Fuente purchase. the delivery from BCP is always on time and in good condition. I rarely smoke unless I'm on fire. I will probably smoke 3-4 cigars in a year. However, I chew on one every day. I like the flavor of the AFC Natural, smooth and it's also a great smoke. The double is a bargain over the regualr Chateau, just cut them in half. arturo fuente makes a great cigar. Had a few in this box that didn't burn well but the flavor was great. Going back to the sun grown instead of the natural wrapper because I never had any complaints with those. 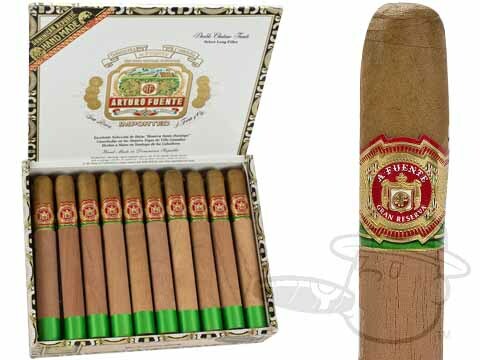 I've ordered these cigars by the box numerous times over a number of years. They've always proved to be top quality, fresh and delivered on time. Tastes like a fresh November rain mixed with Dominican trees. Makes my mouth taste weird? Awesome cigar. Great flavor from begging to end. The Double Chateau is a great tasting mild smoke. It's very well made and a quality cigar. This has become my cigar of choice. Consistent quality and flavor, balanced appeal. I had the most pleasant online cigar purchasing experience with BCP.com. Their site worked perfectly and was easy to use. My cigars arrived one day after ordering them and they were in excellent condition. I couldn't have asked for more. One of the best daily smokes. Great cigar with medium body and great flavor. I smoke these when golfing, so I need a cigar that holds up to a lot of handling , which this does. Provides an hour plus smoke. Occasionally a little harsh at the end. For a little over $5 a stick, you can't beat it. Nice easy smoke with a cool draw. Very pleasant. Another great shout out to the team of bestcigarprices. My cigars not only came on time but beautifully packaged as well. Love this quality company. The chateau smokes well and did not disappoint. Will buy again soon. Again great job guys. My favorite Arturo Fuente, smooth, mild and consistent. This cigar is very mild and smooth. As good or better than more expensive cigars. Very easy on the throat. However, generally the draw is difficult and has a tendency to burn unevenly, causes waste. Can be irritating. This cigar is the perfect size, construction and value for the one a day i truly enjoy. I have been smoking them for 15 years and it is the highlight of each day. Arturo Fuente Double Chateau Natural is rated 4.3 out of 5 based on 37 customer ratings.